Although last season ended on a disappointing note with two losses against conference rivals, Head Coach of the College of Eastern Utah Eagles, Brent Martindale, in his 12th year, expresses high hopes for the Eagles this year, despite only four sophomore players on the roster this season. He adds that the Scenic West Athletic Conference is wide open this year, due to the disqualification of the College of Southern Idaho Golden Eagles, a perennial powerhouse, from post season play. The National Junior College Athletic Association put the team on probation for the 2006-07 academic year. The Golden Eagles will be allowed to play the regular season, but they will not be allowed to play in the Region-18 tournament or the NJCAA National Tournament. Martindale played college ball at Ricks College in Idaho and at the University of Utah. He began his coaching career as an assistant manager at the U of U from 1989 until 1992. 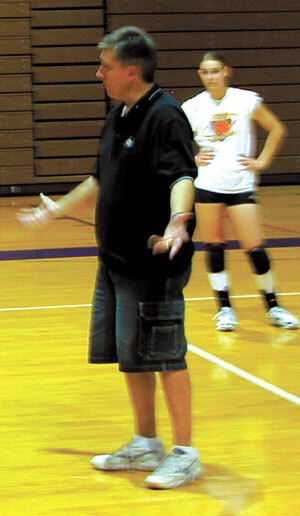 In 1993 he landed his first head coach position with the Utah Predators, of the now defunct Western Women’s Volleyball League. Starting with the sophomores, the 2006 lady Eagles include Maren Ericson, a 5’11” outside hitter from Kuna High School in Nampa, Idaho; at middle Ashlie Baker, from Northridge High School in East Layton Utah, also 5’11”, 5’9″ setter Heather McFarland of Jordan High School in Sandy, Utah and Courtney Young, a 5’10” outside hitter and defender who attended Carbon High School in Price, form the nucleus of this year’s squad. The Eagles signed several new players for the 2006 season including Carbon High School’s Jamie King, who at 6’0″ was a two-time all-state outside hitter. At middle, the Eagles added Olivia Fowler, another six-footer, at middle hitter. She attended Lone Peak High School in Alpine, Utah. Other additions to the Eagles include 5’10” Jennie Rudder of Skyview High School in Nampa, Idaho, who will be playing primarily the middle and 5’9″ setter Kindra Romney, of Mountain Crest High School in Providence, Utah. Karina Rocha brings an international flavor to the team. The 5’11” outside hitter is from Recifie, Brazil, where she attended Boa Viagem High School. Rounding out the squad is 5’4″ Meesha Rasmussen of Carbon High who will play defender; 6’0″ Olivia Fowler of Lone Peak in Alpine, Utah will play middle and Emily Doxey, a 5’9″ outside hitter from Layton High School in Layton, Utah. The Eagles opened the preseason August 25th and 26th in the CSI Tournament in Twin Falls, Idaho. Next up will be the Salt Lake City Community College Tournament, held September 1-2 in Salt Lake City, followed by the final preseason tournament of the year, the Las Vegas Tournament, held in the city of the same name. The regular season opens Thursday, September 21 against conference opponent Snow College, in the Bunnel-Dimitrich Athletic Center on the CEU campus. Three of the first four games are against conference opponents at home, with a match against Westminster College on Tuesday, September 26 being the exception. i would like to be part of the volleyball team!! !